This was originally supposed to be part of our Alphabet For Starters series with alphabet letters on the windows and a rag for my daughter to erase them. But someone got visibly upset when it was suggested she could erase the letters and didn’t want anything to do with that part of the activity. 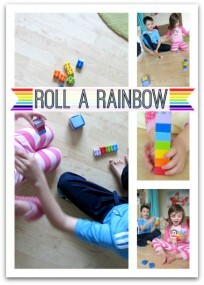 So after we settled her my son and I adapted this for him. I wrote out summer themed words and unlike his sister he loved it. Gather your materials. 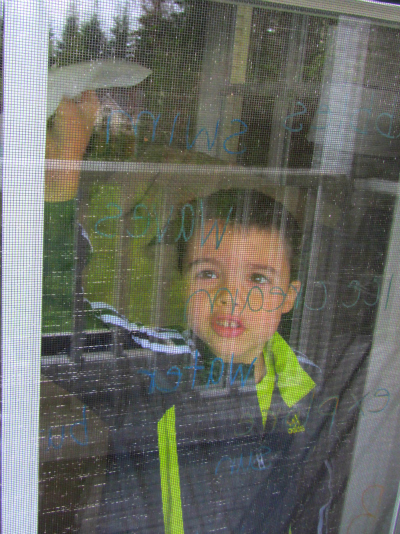 We used window markers, baby wipes and a bucket for yucky wipes. 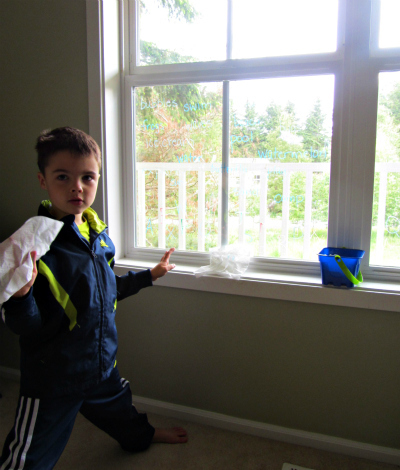 Now feel free to use anything to wipe the windows I am using baby wipes because my son has sensitive skin and anything but sensitive fragrance free wipes pose an issue for him. 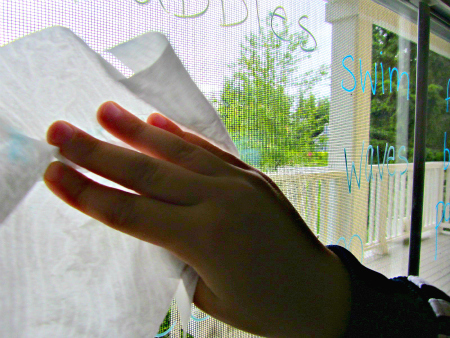 After the activity I took window cleaner and cleaned it properly. 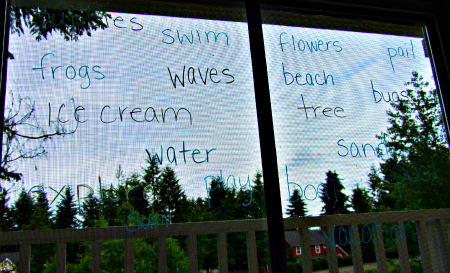 Write out words on the windows. Like I mentioned we did summer / beach house words since we are gearing up for a mini beach vacation and getting really excited. 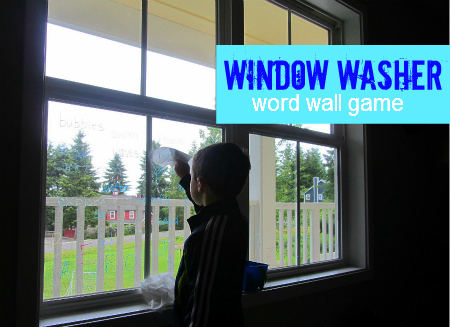 Use any words your child can handle and will be fun for them. 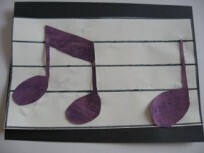 If words are too much try letters or shapes. 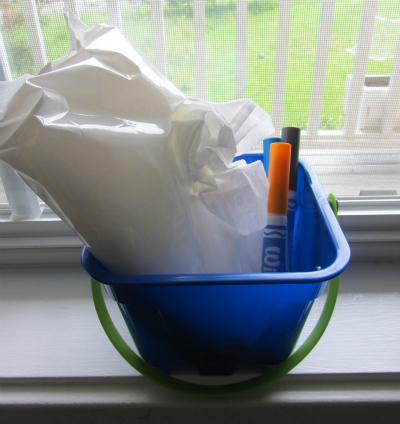 Next get your bucket and wipes ready …. and watch your child wipe everything in 3 seconds flat. I umm forgot to explain the game to him I was so excited. So after I wrote the words out again and explained the game I called out the words and he wiped them once he found them. If you have more than one reader you could even write out the words twice and have a race. I popped out to the porch for a different view. I should have taken the screen off but really I never plan these activities that far in advance and this was very much a spur of the moment one . Make sure to have some challenging words in the mix, most of these were easy for my son to find but a few were a good challenge too. 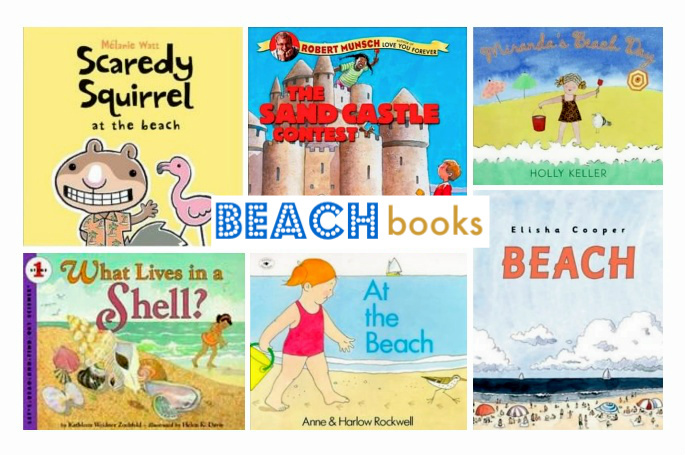 Great round up of the beach themed picture books pictured above. Thank you – my son did too ! OHHHH, this is brilliant! 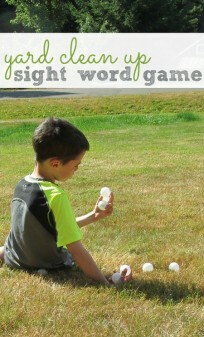 We have been working with a word wall for learning sight words, so this would be perfect to make it more fun!